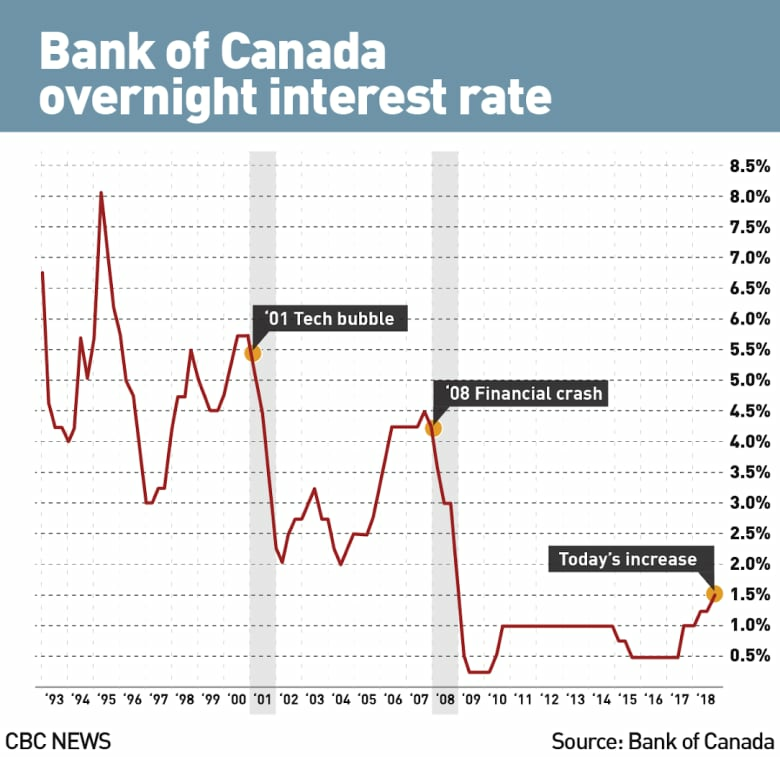 For the fourth time in a little over a year, the Bank of Canada has raised its benchmark interest rate, a move that will increase the cost of borrowing for Canadians with variable-rate mortgages and lines of credit. The Bank of Canada has decided to raise its benchmark interest rate to 1.5 per cent. Every six weeks, the bank meets to decide on what its interest rate will be, based on what it sees happening in the economy. This time, the bank has decided to raise its rate by 25 basis points — 0.25 percentage points — to 1.5 per cent. It's the fourth time the central bank has raised its rate since last summer. The bank's rate, known as the overnight rate, is the interest that retail banks have to pay for short term loans, but it affects what that consumers pay to those banks for things like mortgages, lines of credit and savings accounts. Three of the biggest Canadian banks have already moved in response, with Royal Bank of Canada hiking its prime rate to 3.7 per cent starting Thursday, up 25 points from 3.45 per cent previously. TD and BMO quickly followed suit, and the others are expected to do the same in short order. The central bank tends to cut its rate when it wants to stimulate the economy and raise it when it wants to keep a lid on inflation. The move was exactly what economists who monitor the bank were expecting, as a recent slate of numbers from Statistics Canada suggest the economy is expanding, the job market is doing well, and inflation is inching higher. In its decision to hike, the bank noted in a statement that the housing market is stabilizing, commodities such as oil are starting to rally, and businesses are starting to spend again. From the bank's point of view, those are all good signs for the economy. 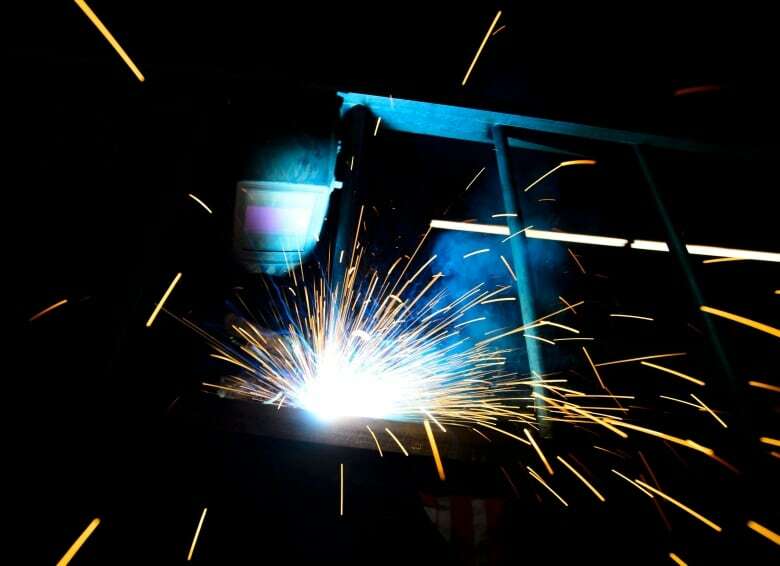 But the bank also said it is keeping an eye on tariff disputes, specifically those on Canadian steel and aluminum. On the whole, the bank doesn't think the impact will be too harsh. "Although there will be difficult adjustments for some industries and their workers, the effect of these measures on Canadian growth and inflation is expected to be modest," the bank said. But that's not to suggest the bank isn't concerned by what's happening on the trade front. 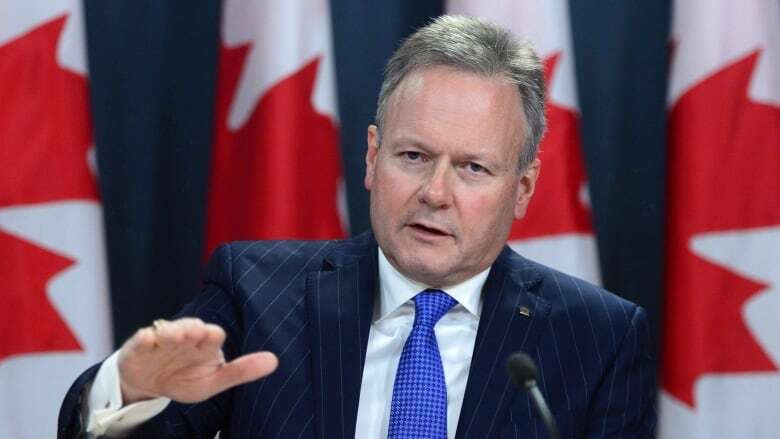 In the statement, the bank said the mere possibility of increased protectionism is "the most important threat to global prospects," and in his comments accompanying the decision on Wednesday, Bank governor Stephen Poloz said trade tensions were "the biggest issue" on the minds of policymakers in recent weeks. In its accompanying monetary policy report, the bank gauged the impact of those tariffs and concluded that it expects Canadian exports to shrink by 0.6 per cent at the end of 2018 because of them. Imports will take a similar hit. In real terms, that's $3.6 billion less going out, and $3.9 billion less coming in, and it will nudge up consumer prices in the process. Poloz was quick to add that those projections are only based on trade developments that have already happened. They don't factor in the possibility of worse ones, such as U.S. President Donald Trump's threat to put a 25 per cent tariff on Canadian made cars. "We felt it appropriate to set aside this risk and make policy on the basis of what has been announced," Poloz said. Toronto Dominion Bank economist Brian DePratto was among those expecting a hike, given the underlying strength in the job market. "We're in exactly the sort of situation that traditionally warrants rising borrowing costs. Of course, beyond the fundamentals, the current economic environment is hardly normal," he said. He expects the bank to keep moving cautiously, hiking its benchmark rate any time it can without harming the economy too much, while keeping a close eye on trade issues. "We still look for more hikes, but think a gradual pace of one hike roughly every two quarters still makes the most sense," he said. "NAFTA resolution and/or receding trade threats would certainly lay the ground work for an additional hike this year, but we won't hold our breath." Trading in investments known as overnight index swaps suggests the market thinks there's only about an eight per cent chance of another rate hike when the bank meets again in September. But by the end of the year, investors are pricing in a two-in-three chance of at least one more hike.